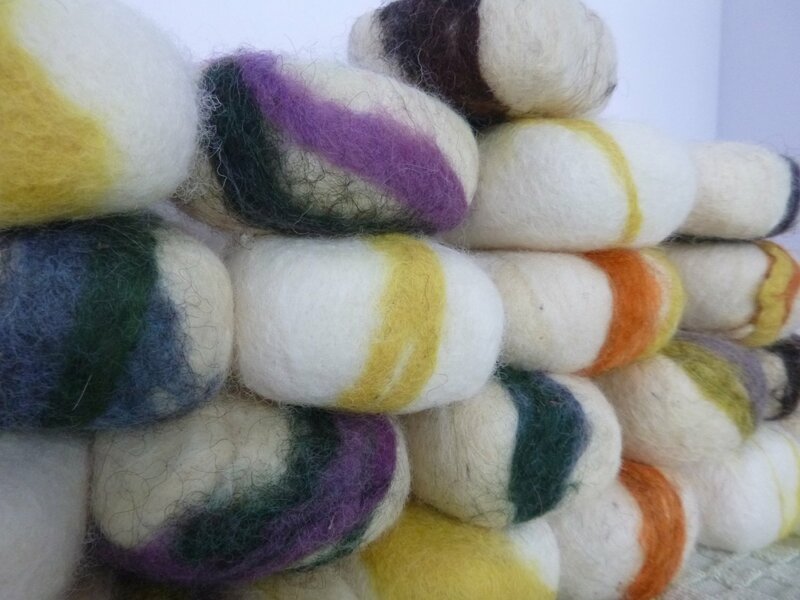 Felted soap - beautiful colors, wonderful scents, and a pleasure to use! Made with our sheep and other Maine sheep, "sheep to soap" - wool is washed, processed, dyed and felted by me and my family. Our felted soaps are also handcrafted by us - soaps that are wrapped in wool and agitated until the wool forms a sheath around the soap. The soap can then be used by getting it wet and sudsing it up! These soaps make great gifts for anyone who enjoys the outdoors - they are highly portable, with no need for a washcloth! The are also great for gardeners and mechanics, where ground-in-dirt is a problem, and for physically compromised people who may have difficulty with slippery soap. Other uses include putting it in your clothes drawer to make your clothes smell wonderful, or under your pillow to help you sleep!